This is from the third day of our trip from New York to the West Coast. 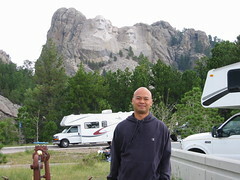 We stopped off in South Dakota to look at Mt. Rushmore. It was VERY cold and rainy. Of course, on the way back, I got lost. It was by far the worst travel day.